Ergon GE1 Enduro grip review. Exclusive Ridley Bikes X-Trail demo day at Whitelee Windfarm. I must first admit that my hardtail riding days are very limited of late. Full suspension bikes are the staple of my job as an MTB guide and instructor, but of late I’ve been hankering for an alternative to my Orbea Rallon, which despite being an amazing trail tool is often overkill for beginner’s lessons and some guided rides. So, when I was asked to check out the Saracen Zenith 29er I jumped at the opportunity. Despite having the stigma of being a sub £1000 bike and all that may entail (crap frame, budget components, unbranded parts), the first thing I noticed was the geometry. A very welcome 68 degree head angle was the first thing I noticed. Coupled with a decent length top tube and short chainstays it shows that there is hope for those of us who’d like a bike that you can potentially ride hard without having to start with bare frame and a custom build budget. What the geometry of this frame means is that it lies somewhere in-between a bike that you can truly attack the trail with and something that will carry you over a challenging XC ride without the feeling of sluggishness that comes with too much focus on trying to appeal to an aggressive rider. A tapered headset, internal dropper post compatibility, 2 bottle mounts and crud-catcher bolts round off what is a great frame alone, regardless of what is hanging off it componentry wise. The forks are Suntour Radion XC-LO-R with 100mm of travel which seem to do a good job under some fairly demanding trail conditions. They are air forks too which means you can custom tailor how “stiff” you want them to be. And with an external rebound adjuster, you can also decide the return speed of your fork. Even without 15mm bolt through axle, they have a fairly burly construction they, so felt stiffer than I expected on the trail. They have a lockout feature too which turns the suspension off, should you feel the need? Some of that front end stiffness comes from the wheelset. It's a fairly chunky DS-700 Araya rim with strengthened spoke eyelets. The rim thickness and eyelets make them a little heavy, but they are quite forgiving and I’d rather have a bit of weight and be able to trust them than have a lightweight option that I have to constantly worry about. It’s also nice to see Shimano centerlock hubs too. Although not having sealed bearings, they are 100% serviceable and very reliable. So you’re unlikely to be caught out by this wheelset. It will likely prove to be very reliable over time. The Shimano M-396 brakes complement the wheels through the hubs centerlock rotor system. This adds rigidity and a firm feel, that some 6 bolt systems lack. The levers are very hard out of the box and feel a bit harsh, but they do stop the bike very well. I suspect as the bike is ridden more and these will start to soften up. It’s a small niggle, but with brakes that work so well, I’d happily deal with it. Shimano’s Deore drivetrain is a staple of the sub £1000 hardtail and does not disappoint on an aggregate of strength, weight and performance. It puts in an appearance on the Zenith to great effect with 2x10 shifting. Rock solid buttons with the sound of definite shifting is the defining characteristic of this groupset for me. When you shift gears, that definite click when the chain moves can be very reassuring. I’m a huge fan of the Deore range as it’s compatibility is wide and it’s cost it relatively low, so if you have a problem out of warranty or want to upgrade something, its both easy and cost effective. Some small things I like on the Zenith 29er: The quick release lever for the seatpin is very welcome. Loads of bike don’t come with them now and the problem is that this bike begs to be challenged. I regularly dropped the post to see it I could get it down some quite challenging trails and the QR lever just made it easier. I like the internal dropper routing too. Mostly as I think every MTB on the planet should have a dropper post. The frame is also presented well with fairly minimal attention to lairy graphics, instead, it’s accented by wheel stickers and saddle colours, keeping it quite classy, but really dynamic. Out on the trail the bike coped well with red-route riding. With a hardtail like this, you’re gonna have to hold on a little harder for sure and this was no different. But I think this could be improved on the Zenith by a more aggressive tyre choice. The Schwalbe Nobby Nic and Racing Ralphs will be enough for most recreational riders I suspect, but when pushed a little harder they can be a little unpredictable under a very stiff frame with only 100mm travel up front. You’d have to ride really hard to make this an issue though. The second thing I might change (again, just me as a harder rider) may be the handlebar width and some thicker grips. I like more leverage and a 740mm width just does not do it for me. WIth increased width comes a bit of flex for comfort and a lot more leverage for handling. I think the bike would be transformed for the more adventurous ride with wider bars and more comfortable grips for sure. These wee hang-ups would never be noticed by the typical buyer for this kind of bike. It’s a very comprehensive package for the first time buyer but at the original RRP (£949) it may just scare off that buyer. The problem is that a little bit over £1000 buys you a “wee bit more” and a lot less than £1000 could be a big saving on your bike? Perhaps you might buy a bike that has less of a specification, but as a beginner you’d never know the difference, having never tried anything better. But at the sale price of £599.99 I challenge you to find a bike with this specification and capability. Bars and grips aside, this is a great bike and for a first time buyer or even a recreation rider’s upgrade it’s fantastic. It also uses the same frameset as the £1399, Saracen Mantra Trail, so should you wish to upgrade almost infinitely, you know you have a solid platform from which to launch! If you want to try the Saracen Zenith 29er, drop into our Kilmarnock store and you’re welcome to actually ride one of these bikes instead of taking our word for it. Click HERE to get almost 40% off the Saracen Zenith 29er hardtail mountain bike. Just £599! There’s many reasons for this blanket statement. They are perfect for someone who can’t ride a normal bike due to perhaps knee issues, hip issues, heart problems? The list is long. People who buy e-bikes are usually looking for a bike so they can enjoy cycling with a partner or perhaps wants to make the commute to work a little easier? There’s a lot of stigma regarding ebikes too. A lot of people diminish thier validity as a bicycle in general, saying it’s lazy not proper cycling? Usually this attitude changes as soon as they have a go on one. When all said and done, who doesn’t want to go out further and get more time on the bike? That’s what it’s all about at the end of the day isn’t it? Recently I was off work for a week and took the focus Sam2 out for a few rides. Mainly because most of my mates have recently purchased them and I didn’t want to take my normal bike. Having been off the bike for just under a month (due to laziness) I thought I would take an advantage of this most popular of demo e-bikes. I’ve tried a few different brands on short rides but never actually had a real good days riding on one at a trail centre. The fFcus Sam 2 has 170mm travel front and rear, but it’s lighter than most other bikes on the market meaning its handling is more like a "normal" bike. In this respect it's very impressive. First impressions on the Sam2 are always good no matter who sees it. The Battery is tucked away in the downtube and the shimano e8000 drive unit is smaller than most of it's competitors. The "enduro" style geometry isn’t sacrificed either so you can make the bike the exact same size as the non ebike version and the narrower Q factor means the cranks are the same width as a standard shimano set up. So on paper it all looks good as a bona-fide mountain bike but what’s it like to ride? There are three modes on the shimano system Eco,trail and boost. Everyone likes a bit of boost, but I stayed in eco most of the day so my legs still got a good workout on the climbs. We set off from the bottom of Glentress (Tweed Valley 7 Stanes trail centre) and climbed to the buzzards nest car park. We of course ended up passing some riders on non e-bikes so the comments were flying back and forth. A little under 3 minutes into our ride, cries of "oh that’s cheating" and "you're making us look bad" split the trees. The truth is I’ve never had as much fun going up a hill. Cruising at just over 5/6mph was a dream, and once at the top, you’ve still got a sweat on and you can still feel it in your legs so what’s different? So it's a good work out, but we still have some help from the motor, so we carried on up to the mast. With a few short stops we got to the top in under 25 minutes. Good going I’d say, but it’s not as if we were flying. Just having a laugh and everyone was still smiling. On the descents is where this bike fully comes into alive though. We headed down the boundary trail and into "Hush Hush" (steep enduro style stail) Having only done it once before (on my santacruz Nomad) I thought I’d take my time. The bike had other ideas! The extra weight and the amazing linkage on The focus made the Sam2 take off like a rocket (no electric assistant on) the extra weight makes it corner like it’s on rails. I could hear the tyres digging in for grip and with the linkage soaking up all types of bumps, keeping the back wheel planted it sling-shots you out of corners. We all came out of the trail grinning. We couldn’t believe how much faster the Sam rode down a steep, technical trail. One of the other guys on the ride who recently bought a Sam2 (this was his first proper MTB ride on it) said "I need to adapt my riding to keep up with this bike"
The brakes were pretty hot due to the bike being a little heavier which you don’t actually notice when your riding, and you can still pop off roots rocks and anything else on the technical trails. Once we climbed back up to the top, my legs were starting to feel it but still felt like I had plenty in the bag to carry on. We'd rode just short of 15 miles which isn’t a lot by any means but we had climbed 4159ft and we had a 2 hour drive home. We didn’t feel totally destroyed, but my upper body definitely feels like it's had a workout from just manoeuvring the extra weight around. Overall I think you get a better work out on one upper and lower body with extra grin thrown in. That’s what it’s all about for me. Going out with your mates, flying down hills, laughing and having a massive smile or you face at the end of the day! On the Focus Sam 2 I was quicker on every descent (with the assistance off) and the climbs were faster. But here's the selling point. I would never have thought of riding 15 miles with over 4000 feet of climbing after being off my bike for a month. Not only that, but the next day,you're fresh and ready to go again! At the end of the ride my thighs were burning arms were on fire and shoulders felt like I had been on a moto x bike. No wonder so many people are turning to these things for training! The bike overall is a total animal. The bike just flies down descents, kicking up massive rocks drifting round turns and flying off massive jumps. I threw everything at it that I would have a "normal" MTB and at the end of the ride I had a little under half a battery left as well. I’ve tried a few shorter travel e-bikes and none perform like this. Even on the flat sections, with no assistance the bike is picking up speed everywhere! So before you make fun an e-bike try one! We have a new hire fleet coming soon including focus and Orbea e-bikes. So come try one for a day or two. Go to a trail centre or do some enduro trails and I can guarantee your mind will be changed. Your past opinions e-bikes will be there no more! They definitely are the future (for some) and there here to stay. So you better get used to them. This is the first cycling blog I’ve written. I’ve tried a lot of different products but never actually wanted to write about them. With this bike though, I simply wanted to let everyone know what there missing out on. I can guarantee you won’t have as much fun on a bike if you go out with a few other guys on these! First up I’ll say that I usually like a thick grip. I’ve been using Lizard Skin North Shore grips for years and more recently been experimenting with DMR’s Death-Grips. So when I decided to try the Ergon GE1 it was on a bit of a whim. I’d had Ergon grips before on my Trek Stache for long distance hacks and bikepacking trips and with a 17 degree sweep on it’s handlebars, they were extremely comfortable. People generally don't really associate Ergon with the place in the market that the GE1 occupies, instead assuming that the wide contact, bar-end moulded GP series grips were the best they had to offer. But that's pretty far from the truth as Ergon produce a whole range of very subtly contoured MTB grips in a range of sizes and colours. But for now we’re looking at the GE1 MTB Enduro. ...However, after a few miles I felt like I was closing my hand too much and really gripping the bar for dear life. This was most likely just a throwback to the thickness of my normal grips and didn’t last long at all. I wear Fox Ranger gloves which have no padding so you’d think they would make no real difference, but during the bout of pins and needles I was having, I took my gloves off to see if I could relieve some of the sensation. This is the first time I felt the grips with no gloves and I instantly felt like doing something I never do. Ride my bike without gloves on. I undid the retention grips bolts slightly so I could turn the grips by applying some rotational force and found that the slightest movement made quite a difference. Once I’d got the various parts of the grips many profile area lined up with my bare hand, the comfort came very quickly. But I didn’t want to put my gloves back on as once they are dialled in, the feel of these grips is awesome. When I finally put my gloves on, the feel was still there, but I couldn’t feel that awesome Ergon texture that offers so much grip and feel to your bare skin. I’ve never quite grabbed a grip like it in 30 years of mountain biking. Ergon claim that the profile of the grip forces you to get your “elbows out” as the grips profile is twisted by 8% (compared to a normal linear grip) to make your hands sit at a more ergonomic angle. I didn’t notice this as I’m quite “elbows out” anyway, but they were very comfortable when adopting that position. One of the most surprising things as the GE1 grip I’m using is the thinner of the two options available. Theres a highly profiled 32mm and 30mm option on offer, both of which are narrower than the linear 33mm circumference of my old faithful North Shore grips. So if you think you need a thick grip, I’d recommend giving these a try and see if the average size and varied profile can make a difference to the way you hold onto your handlebars. Construction is good with the hard hard anodised matt black lockring finishing the inside ends off nicely. The clamps are also lazer etched with alignment markings as well as left, right, up, down just to erase the fear of fitting them wrong. The outside end caps are integrated and colour coded too. They are also available in blue, black, red and “lazer lemon” (tested) so there’s a customisation option there too should you want it? I am most likely a convert to these grips as they offer substantial adjustability and the texture on the hand is really quite lovely! If you ride with no gloves, please try these, if you do wear gloves, get some thinner gloves and try these. I reckon you’ll be surprised. Now I’m off to try the GD1 MTB grip on my pump track bike which currently has my tired old North Shore grips on it. I have to say, they’re looking a bit nervous! The new 2019 Santa Cruz 5010 C S-Build is on it's way to us! Yep, this is later than I had intended, but I had a few injury issues earlier in the year which caused me to stare at this fully built bike sat in my kitchen, just in view from my TV seat where I was resting the torn ligaments in my right foot. It was deeply frustrating as it was just a stupid injury that I didn't even do on my bike. If you've ever torn a ligament(s) you'll know what the pain is like. There's just no way you can ride a bike in the direct aftermath. Great intentions oft' go astray... As this short video will attest! Anyway... I'm back on my feet (foot) again. I built this bike in January and didn't get to really ride it until late in February, so I'll just do a basic run-down of the spec and why it was built this way and in part 2 I'll get heavier into the way it rides. So I should clarify that my preceding bike was a Bronson CC. The very same bike that Danny Macaskill rode on his film "The Ridge" Same forks, same wheels, even the same colour scheme. In fact, 90% the same bike. An absolutely rock-solid bike that would take just about anything you could throw at it. But I had a problem with it. The more eagle eyed of you will notice that this bike is also (almost) a complete replica of Danny's "Wee day out" bike too. Not a fanboy move, just a preference of the colour red over the other matte black version that was available at the time. My Bronson was just too much bike in the context of how I use an MTB. I could straight-line anything on that bike and once I'd got used to this, it DID make me faster and more fearless, but I found it a bit of a chore to ride outside of the short bike ride kind of day. I spend a lot of time on my bike in one go. 7 hours, 8,9,10... Bothy rides, overnights, big loops, point to point riding and the like, so I started my research on the 5010, the bike that Santa Cruz launched (originally as the SOLO) with this type of riding in mind. Everyone remembers the Advert with Steve Peat shredding Torridon's Corrie Lair path? Outside of a few car park laps on Dirtschool's Andy Barlow's 5010 and a couple of short rides on demo bikes, all I had was my research and the general idea that this would be a bike that would fulfil the following needs. A: Easier to pedal with a harder actuation of the shock (shorter back-end) meaning less pedal bob and super tuneable with the DPS shock. B: Less "forgiving" on the big stuff and would make me learn how to ride lines and obstacles all over again. C: Just be a better, more comfortable riding position (longer top-tube) with a weight that I could deal with on very long, unassisted rides. I also have been spending a lot of time stopping and starting and attending to less experienced riders both in my private riding life and my role as an instructor for Ridelines Mountain Bike Tuition. So the burliness and travel range of the (MK1) Bronson was becoming a bit of an issue. I felt like I needed something a bit sharper, a bit less docile and something that would challenge my riding a bit more. I'd had a shot of the new 27+ Tallboy CC and loved it, but it was very XC. Totally manageable, light, flick-able and a really enjoyable bike for covering distance efficiently and chalking up loads of fun miles. But I felt that it got out of its depth very quickly indeed and usually without much warning. So the 5010 is where I ended up. It really is the simplest of bikes at it's core offering 130mm of VPP travel through 27.5 wheels, boost axle spacing front and rear, a 67 degree head angle (just 1 degree less than a Bronson) and 334mm BB, again just 7mm lower than a Bronson. So, a pretty aggresive shorter travel machin. Stick on a 140mm Pike RCT3 and you have a bike you can really get your teeth into on the fast stuff, but will be super hospitable on the everyday ride front. It's as comfortable is it is unforgiving, as fast and flickable as it is predictable and as light as it is strong and stiff and efficient. It really is quite an engineering miracle that bikes can now be made this light, this stiff and this strong without cutting any corners. In a quick spec run-down, all I really pushed the boat out on were the wheels. After having the super stiff ENVE 60 Forty on the Bronson, there was just no going back to alloy for me, not at least while I had access to a alternative. The DT-Swiss XCM1200 wheelset is both strong and super light with amazing hubs and race proven pedigree, so there was really no other option for me. The reat of the bike is Shimano M-8000 XT with the exception of an XTR rear shifter, just because it feels so nige on the thumb. I guess you could say that a Chris King headset is a luxury? But in this day & age, this product is indispensable as a staple part on any high-end bike that is going to be used as the designer intended. It will outlast a half dozen other headsets and most probably still be on the bike when it eventually moves on from my ownership. Other bits from companies like Race Face, Gamut and KS again are just hard wearing parts with good pedigree that will likely stand the test of time. The one other finishing touch I added was from Invisiframe. £70 for this product is a no-brainer when you tot-up the money invested in making all these parts look like your dream bike. So as a brief introduction to the bike (this particular bike) and why I decided on it, I guess that will do. I've ridden it fairly regularly for the last 3 months and even done an endurance racing event on it. So once I've got some riding photos back, I'll do a follow-up on my component choice and some feedback on how she rides. Probably in a short video. Get on board with this exclusive demo day offer from Sprockets Cycles in partnership with Ridley bikes. We have managed to get hold of the UK's only demo fleet of Ridley X-Trail bikes for an exclusive, one day only demo experience at Whitelee Windfarm Visitor Centre on Sunday 30th April. The X-Trail is a real do-it-all drop bar bike. While the race geometry allows you accelerate quickly, the disc brake wheels with thru-axle can make you stop stable and within the blink of an eye. And with the 36mm tire clearance, you can add a big piece of extra comfort to your already enjoyable ride. Why would you need 3 different bikes hanging in your garage while you can have an X-Trail? Fast on the road, comfy on the trail and a cool factor that is off the scale! First ride will set off around 10am from the Visitor Centre car park for around 2 hours, the second ride will be after lunch at 2pm for the same route, so please book your required bike for the appropriate riding slot. We won't be leaving anyone behind and we'll be stopping for chat, rests and photos along the way. We'll supply some energy products and make sure you're looked after along the way. You can ask any questions you like along the way and Andy will be more than happy to answer them. You will have to register for this event and choose a bike ticket for your size and model. Please only register if you are definitely coming as when a ticket is gone, that bike is gone and someone else may miss out. Availability is exclusive to registering on Eventbrite, not through contacting the shop. If you need any advice on choosing your correct size, please click HERE and select the geometry tab for more information. Haibike Sduro Full Fat Six full suspension Ebike test. Electric bikes are quite divisive right now. Not because they don’t work or because they have no place in the market, we think it’s because the main manufacturers launched their product in the enthusiast cycling press, which is proliferated by people who say what they like and like what they say. It’s cheating, it’s for lazy people and similar opinions are the most popular howls heard from the unknowing masses that simply take their opinion from the online echo chamber or simply refuse to acknowledge e-bikes exist, despite never having been near one. So when we decided to go all-in with e-bikes it raised a few eyebrows. For a bit of fun, we thought we’d make a short video about how versatile one of these bikes can be, so after the recent morning blizzard in South Lanarkshire, we spotted that the 700m peak of Tinto Hill near Lanark was the only place the retained some snow in the afternoon, so off we went. We chose the Haibike Sduro Full Fat Six full suspension fatbike to give us the best chance of summiting. But not only did we want to summit the hill, we wanted to get to the top without leaving out any of the obstacles in our way. Quite a challenge! The Sduro Full Fat Six uses the Yamaha PW drivetrain system which pushes out around 44Ib of torque (more than a Morris Minor!) and assists you to just over 15 mph through a few different modes: Eco, Tour & Turbo. It also has 4” tyres and 120mm of suspension travel meaning grip on the trickiest sections should be around the maximum we could expect from the bikes available to us. On the flat, it's just too tempting to whack it on Turbo and just smash along so this is just what we did, there's just too much fun to be had getting up to speed and the power delivery is spookily smooth, but speed won’t help you when it gets technical. One of the first things that turned us from cheesy grin to determined face was the realisation that Turbo mode is not the only mode. When forcing the bike up the grass & granite steps on the walker's path, the torque was just too much for even the 4” tyres to soak up and resulted in spin-outs and dismounts. But determined not to walk any of the route, we walked it back and attempted the section again. Knocking down the power to the Eco mode actually slowed the torque delivery down to the point that we could mix actual riding technique with the benefits of the assistance from the 250w motor. Once we’d figured this out, we genuinely cleared every obstacle on the hill. Gary is an excellent rider with a wealth of experience in wild riding, but even he was fooled a few times by the power delivery, using every bit of his skill to prevent wheelspin and oversteer when the grip was challenging the tenacity of the Schwalbe Jumbo Jim tyres. The conditions were actually quite bad. The trail was waterlogged at low altitude and icy at higher levels with the wind playing it’s part all the way up. Although we had to go back and attempt a few sections to get them cleaned, we both thought that on a day with better average conditions that the bike would ascend the whole hill without a stop with no problem. The weight of the bike is substantial at around 25 kg, but in the right mode, it just pales into insignificance as the Yamaha PW motor carries the bike with such efficiency. The trick is that when you are climbing, you stay in the power-band. Just slow down, keep your cadence high and let the motor do the work. Once you have figured it out, this bike will take you almost anywhere. With real life battery ranges of around 90 miles (130 km) you can rely on the 400w battery to take you where you need to go and probably back again. At Sprockets Cycles we have a huge range of electric bikes from Haibike, Ridgeback and Saracen. We have demo and hire models so you can try before you buy and see for yourself how versatile these machines really are. You can buy an e bike at Sprockets Cycles from as little as £1599 and we offer performance electric bikes with price tags up to £7000. Here’s a short video about our few hours on Tinto trying out the Haibike Sduro Full Fat Six. It was a genuine surprise that we managed to scale this tricky hill without missing a section. We're excited to announce that for the first time we'll be attending a public show! Not just any show, the biggest outdoor pursuits show in Scotland! The Scottish Cycling, Running & Outdoor Pursuits show is taking place this weekend on the 10th, 11th and 12th of March 2017 at the SECC and will feature many amazing brands and retailers in the same place delivering the very best representation of how to explore the outdoors right here in Scotland! We'll be there with Ridley bikes, Santa Cruz, Haibike, Ridgeback, Cervelo, Garmin, Madison and a few more. So come by and see us as we'll have a few exclusive SCROPS offers and activities you can take advantage of. We'll be having an amnesty in conjunction with Garmin where you can trade in your old GPS fitness band against up to £140 off selected top end Garmin cycling units and watches. We'll also have some amazing clothing offers from Madison and a particularly "visible" deal on the HUMP Signal waterproof cycling jacket. Usually retailing for £79.99. we'll be selling these amazing jackets at just £39.99! There will be limited stock and we are unable to hold these or re-order, so get along Sprockets stand first thing and pick yours up! We'll be there with a fully operational Zwift set-up too. Hooked up to a top of the range Elite Drivo smart-trainer, you can have a go at the latest craze in training. With Zwift, you can battle other riders accross the world and take part in competitions with pro riders and weekend warriors alike. We'll also have trained staff on the stand to advise you if you have any questions about Zwift. So come along and see us at this years Scottish Cycling, unning and Outdoor pursuits show this weekend. Lazer Revolution MIPS helmet review. Around a year or so ago, the Lazer rep showed me this helmet in near finished form and I was generally quite "skeptical" to say the least. It was just too weird, too kooky and just did not appeal to any of the dumbfounded guys behind the counter who also felt the same way. A few months of wearing the MIPS version of the finished article though and I'm actually finding a hard time finding anything wrong with it! So, the "problem" is the immediate aesthetic. You either want to look like a Rogue Squadron extra from Star Wars, or you don't? From every angle this helmet is different, it just screams different, but I remember when POC released the finished Trabec model and everyone kinda scoffed at what became one of the most popular trail/Enduro helmets on the market. I think that's what is happening with the Revolution, people are coming around. The unique shape actually helps accommodate a few features that the "Enduro set" will enjoy, such as a huge range of peak adjustment and a very generous rear step in the vent profile so your goggles don't ping off your head! It's also customizable. You can by colour coding kits for the peak and ear surrounds to get a bit coordination going with the rest of your gear and the supplied "ear muff" attachments actually make it look cooler in my opinion. These wee blinker type attachments also keep a lot of the cold off your ears when the weather gets chilly. In the heat though, 23 vents keep the air flowing over your head and the body sits on your skull with what feels like very minimal contact, so despite the small weight penalty, the helmet feels light on the head. Another reason for this is the MIPS system that feels a bit like a second retention device as it's soft material cradles you head like a reassuring yellow plastic, protective hand on your bonce. MIPS is a revolutionary technology that lets the helmet slide and rotate a short relative distance from the head to dampen rotational and angular impacts. I've been to the Scandinavian lab that developed the technology and I was mightily impressed by the evidence for mitigating some of the trauma caused by these types of injuries. A great addition to any helmet's features. Also keeping your helmet stuck to your head is Lazer's ATS (Advanced Turn-dial System) that really locks up the shell to your skull without squeezing it in any particular way. The full coverage shell, MIPS system and ATS make sure that the Revolution stays in place on every axis when you're bouncing around on the trail. Another cool feature is the breakaway Gopro mount. Since the "Schumacher incident" there's been a bit of a debate about helmet mounted accessories in certain circles, but Lazer have put safety first by combining an excellent and MIPS with genuine breakaway mount that will simply detach at any sign of significant impact whilst being strong enough that you don't lose your camera! Another great feature is detachable chin guard that turns any Revolution model into a full-face helmet ready for Enduro or downhill duties. When it's fitted, the Revolution boats a full ASTM-DH certification, meaning it comes in fully race legal and the weight of a carbon helmet twice the price. Very impressive! The full face conversions also comes with a longer peak to complete the transition to full on Gnarr. Colours are all over the place from plain old black or white, to full on camo patterns and lovely colour mixes like the one we have on test, and of course there's the option of customizing your ear surrounds and peak. From the second I put this helmet on I loved it. My inital prejudice dissapeared immediately and out of the 4 helmets I currently have at my disposal its the one I go to first. I don't think I've ever worn a helmet that's made me feel more confident in the saddle. Ample protection, unique looks and all the features of some helmets that have an extra price premium attached. Check out the full Revolution range HERE starting at just £99.99 for the standard version. Wishbone design trikes and bikes at Sprockets Cycles. By far the coolest thing for pre-pedal cycle kids we've ever seen is Wishbone Designs' range of very cool wooden balance bikes, trikes and wheeled buggies. They have been a real revelation to us all here at Sprockets Cycles since they arrived for the opening of our new store. Prices start at just £79.99 for the Mini-Flip ride along buggy that also converts into a rocking horse with no tools required. Have a look at this cool wee guy in the video below. The Mini-flip can also be customised with different coloured parts, wheels and stickers. Also at £119.99 we have the "Flip" the big brother of the Mini-Flip that is larger, with castor type wheels for bigger kids to steer with their feet. We have them both in store now, so come and have a look! Wishbone Designs have a very high ethical & environmental standard and even make a recycled version of their popular 3-in-1 balance bike/trike combo. The WIshbone RE comes with the very cool "Rotafix" system that allows you to adjust the middle of the bike lower or higher depending on the inside leg of the user, ensuring you get the most out of the 3-in-1 nature of the product. It's a very cool feature that is quite unique amongst this kind of bike and ensures that you get the best value for money. The 2-in-one version is just £149.99 with the 3-in-one version coming in at £169.99. Have a look at the video below for a demonstration of how it works. We also have the standard 2-inone and 3-in-one bikes. These are our most popular models starting at just £159.99. They are fully customisable with different coloured stickers, grips & seat-pads, so your little riders can make them unique to their own style. At Sprockets, we're a fully fledged and fully stocked Wishbone Designs dealer. So come along and see this unique range of bikes, trikes and pre-cycling buggies that will get your wee ones on wheels sooner than you thought was possible! Oh yeah and the VERY cool wishbone wagon! With this deeply subjective weight bearing part always in the firing line, whether it be the torque of rotation or the odd crank/pedal strike, the attrition rate between failure and success in pedals can literally hang on picking a bad line on a fairly easy trail. I won't dwell on what everyone knows; that BB's are lower and crank-arms are not getting any shorter in the realm of general specification, so the super slim pedal has been the ongoing "solution" to the problem. The pragmatically named high-end offering from the San Jose component gurus is one of the top drawer attempts at making a difference. These pedals have been fitted exclusively onto my Santa Cruz Bronson which is probably more the type of bike that you'd expect to see these on. They have been ragged to death with no servicing so far. Dragged through local dusty days, trail centre muddy days and 50 mile back-country rides with river crossings and sandy beaches giving them hell along the way. These are firstly pretty light for a set of pedals with 4 sets of cartridge bearings and a cro-mo axle inside and with a 298g claimed weight Vs 305g on our scales they'll be at home on any bike where you're worried about that kind of thing. But they're flats though right? so they're probably gonna be put on a bike that will be put through the wringer at some point with aforementioned rock strikes being a daily issue so what's a few grams to potentially avoid that hit that sends you OTB eh? Some other reviewers have noted that the platform is not big enough but at 100x100mm but you'd think this would be big enough for most feet? The issue is that the inner bearing sits firmly against the crank arm presumably to reduce leverage and allow some axle & bearing girth, this bearing is obviously inside the cage and the cage is where you put your foot. So the first pin you find is around 10mm from the crank arm meaning you have to have your foot in pretty tight to take full advantage of that part of the platform. Theoretically this means your foot may roll off the outside of the platform. This does make sense "on paper" and is pretty obvious when you look at the product, but to be honest, I have never noticed this as being a problem even with my size ten Five Ten VXI's which have pretty wide soles. I suppose this depends on your riding style? These pedals are just 10mm at their fattest and 8mm at their thinnest, but impressively there are 4 sealed bearings crammed inside each cage which is pretty good going considering some pedals that are just as thin as this still rely on bushes that squeal and rattle after a few hard weeks of riding (granted they are not usually £110) After all this time I've had zero issues with them and they only have a very slight bit of movement which is to be expected, but they don't rattle when you drop the bike, you have to coax the movement out of them by hand. The pins are super long & super grippy. I've had the soles of my shoes stick to the pedals momentarily (and regularly) which has made my heart beat pretty quick sometimes whilst getting off the bike. They are pretty evil and also hollow, which most likely adds to their effectiveness as mini apple-corers on your shoes. As good as they function though, the pins are really fragile and bend without much persuasion on just about any significant contact. These are the first incarnation of the Podium pedals and apparently the ones that ship now are coming with heat treated pins, so this should not be an issue moving on. The good news is the pins are available as replacement kits in black, blue, red and silver colours. I've loved these pedals if I'm honest. I just don't have any issues with them and only came across the opinion on the platform size as I was researching for this article. Hopefully I won't consciously look for this issue when I next use them. They are super grippy, light, low profile and very nicely styled too. The bearings have been great and the finish has stood up rather well considering the abuse they've had. I suppose at £110 they should do everything I have experienced with them? But really nothing is sold for RRP these days is it, so as with everything else, support your LBS and see if we can hook you up with a deal. "A great pedal at a price that isn't really unusually high these days. Savage grip and bearing longevity seems to be built in too. I wouldn't hesitate to recommend them." See them for sale here. Remember if it's online then it's in stock in store at Sprockets Cycles! We're happy to announce that we're now an authorised supplier and fitting agent for Invisiframe protection. If you've never seen invisiframe you'll be amazed at the way it blends into the aesthetic of your frame. We're seen frames protected by invisiframe where you can barely see the product. It's truly amaving and super tough! Invisiframe kits start at just £71.99 plus £30 for fitting for a full suspension frame already listed on the Invisiframe website. Custom kits are available for any bike too. If you already have your Invisiframe kit, we can take the heartache out of fitting it yourself for just £50. The vinyl is a premium quality automotive vinyl, which has been developed to protect car paint from stone chip and abrasion damage. We can’t promise to protect your frame from major damage but the protection kit will protect and minimise general trail wear, scuffs, abrasions, stone chips, storage and transportation mishaps keeping your steed looking newer for longer. The vinyl will help keep your bicycle paint work looking brand new under the protection. The gloss vinyl can be polished adding to its longevity and in turn keeping you bike looking good. So this means that all of those annoying little scratches crated from muddy trails can be polished out! About this time every year our industry magazine "BikeBiz" asks customers of independent bike dealers (IBD's) to vote for the shops they think deserve to be included in the annual list honouring the cream of the industry. This year, the response form our customers has been overwhelmingly positive with Sprockets being included in the top 20 list after just 5 years of trading. If you bear in mind that there are estimated to be around 2500 ACT registered bike shops in the UK we are really humbled to make it into the top 1% of what customers are looking for from a bike shop. We'd all like to thank our customers for the great tesemonials and your support sinc we opened the shop. Have a great summer and we hope to see you in-store and on-line soon! 20% off in store only this weekend! Terms and conditions: the 20% offer (the offer) is not available in conjunction with cycle-to-work vouchers, finance payment options or items already on sale. (sale items can be bought at 20% off the original rrp) If you wish to order items not in stock then you must pay in full to take advantage of the offer. The offer starts at 9am 16/4/16 and ends at 5pm 17/4/16. there is no cash alternative. When our boss came to us with a Santa Cruz Stigmata Cyclocross frameset and a pair of Mavic Crossmax SLR 29er wheels we knew some fun times lay ahead.......Make this work with XTR Di2 he said. The Mavic wheels were an obvious choice as both Frame & Fork on the Stigmata come with the bolt through axles to keep things nice and stiff, as most of us here are predominantly mountain bikers we know the benefits of having these available. First things first, had it been done? We couldn't find any successfully completed attempts, or any actual attempts at all! What can go wrong? A couple of calls to Rich, the Shimano Tech Expert later and we had the ball rolling, half an XTR Di2 Groupset, BR-R785 Hydraulic Road Calipers and ST-R785 Di2 Shifters were the starting point. Not one for keeping things easy Craig wanted a Rotor Chainset with a Q-Ring, but also a Narrow Wide ring to keep the chain in place. A quick call to the Rotor Crank distributor and we managed to source ourselves one of the New Rotor 3D CX Chainsets with a Ceramic BB, and a QCX1 Narrow Wide Q-Ring, interesting to say the least. Its possibly one of the only chainrings with the Narrow Wide profile that are available above the 36t mark. We wanted to go with an 11-40t XTR Cassette as it should aid climbing on some tough cross courses, this was the obvious choice as no road cassettes reach to that ratio. This was also one of the main reasons for the Mavic Crossmax wheel choice, 11spd MTB cassettes have a different inner width to road cassettes, and as such will not have fitted on your usual cross wheel. Another quick wee phone call to Rich and we had ourselves a build day! Rich was kind enough to come to the shop and offer his services showing us how to setup and adjust the Di2 kit and teaching us some of the hidden capabilities the electronic shifting has to offer. So what are the shifting options when you have 2 Di2 shifters and only one derailleur? The options are endless! We opted to shift up on the right and shift down on the left, this can be programmed to shift in any way you can dream of. Shifting is unbelievably smooth at the rear, and the Q-Ring upfront is definitely going to turn some heads and keep the chain in check. After Rich had worked magic we set about finishing it off, 3T Ergonomic bars with Supacaz Bar Tape, Shimano PRO Tharsis XC Stem with internally mounted Di2 Junction box, keeps the front end looking clean and cable free, also means the topcap is no longer required, again, thats going to turn some heads! Thomson Seatpost and WTB Saddle finish it off. So, The answer to the original question, can you run 1 x 11spd with a mix of Road and MTB Di2 parts? Yes, you can. We would like to thank Rich the Shimano Tech expert for his help, both Dave's from Madison for parts and moral support, Gregor from Silverfish for the Bar Tape and Bar End Caps that don't "Faw Oot" Matt at Mavic for the wheels, Jungle Products for the Frame & Fork. My initial interest in trying out the Cannondale Synapse HM Black was to test the Shimano di2 electronic gears to check if it was a gimmick or as good as the reviews say. Well, I can confirm that the electronic Dura Ace shifting set up was even silkier smooth than most of the write ups suggest. But that's only the beginning of the story on a bike that could have been made with tough Scottish road conditions in mind. I took the Synapse out from Sprockets Cycles in Kilmarnock round some of my regular roads in and around the villages of Craigie and Tarbolton. The council have recently resurfaced some stretches of new Tarmac on some of my favourite climbs in this area. But most of them still have surfaces that could challenge Paris-Roubaix - without a cobble in sight. The Synapse made light work of even the roughest of surfaces, thanks I'm guessing to the combination of frame & fork cleverly designed to absorb those shocks and made out of Cannondale's highest spec carbon. The chunky 28mm Schwalbe One tyres also played a starring role in that pot hole busting comfort too. It's no surprise that a number of pros use this machine on some of the European cobbled classics. I have to admit to being a wee bit nervous taking out a machine costing more than £6k out on a howling gale on the back roads of Ayrshire. Think about Ferris Bueller's pal taking his dad's classic Ferrari out in the movie of the same name and you'll understand my trepidation. But the Synapse is the most sure footed bike I've ridden. Ever. Ok, I only hung up my running shoes a couple of years ago to concentrate on two wheels. But I've tried out a fair few super bikes in that time. And spent a few quid living up to the n+1 stereotype of the new breed of riders! I started my ride with the rough surfaced and steep climb of Craigie Hill. Just outside of Kilmarnock this is a coveted Strava segment. I pointed the Synapse into a howling headwind and hit the broken surface of the climb. I'm not saying I took the KOM, but even into a severe wind the uphill felt effortless and the bumps that test my own good road bike seemed to disappear. Parts of the climb that I'm usually trying to muscle my bikes up were shrugged off and I was up and over in good time. Then there is the Synapse's performance on fast descents. I've never felt more confident as I watched the Garmin tip 40mph coming down "Scoots" out of Tarbolton, and didn't feel the Vision carbon rims were being impacted negatively by the buffeting cross winds. With a steady rain beginning to fall the roads were beginning to look treacherous. But again I felt confident leaning into fast corners on the descents. That confidence is boosted by the stopping power of the hydraulic disc brakes. I'm used to discs on my cross and mountain bikes. I challenge the most anti-disc roadie to not fall in love with the Synapse's braking power on a wet and windy Ayrshire day. It's definitely the sensible way ahead for the vast majority of road riders. The Synapse with discs is still feather light, so there goes that argument against discs. There's no doubt that the Synapse's geometry is more relaxed than racy. But it felt plenty fast and responsive to me. In fact the slightly higher head tube made me think I might have made a mistake by slamming the stem on my own bikes. I was only out on the Cannondale for 20 miles or so. But on tough bumpy roads, with a fair few berg type short sharp climbs and in a punishing wind it was a pleasure to ride even against that triple whammy. In fact I'd go as far as saying it is the perfect high end bike for our infamous British roads. I'd love to get it out for a 100 miler or a testing sportive. To me that's where it'll really come into its own. The ride comfort of the Synapse is superb thanks to the shock absorbing design, top end carbon and those Tarmac crunching tyres. But a special mention has to go to the Fabric saddle - a carbon railed thing of beauty and comfort. Did I mention the paint job? The stealth black of the HM is subtle, but beautiful. Looking down on the stardust effect top tube makes you feel you're at the helm of a true thoroughbred. If I could only have one road bike, I'd be saving up the pennies and beating a path to Sprockets for this one. Over the winter, I competed in cyclocross races, fighting through muddy bomb-sites on my Frog bike, almost every weekend. But now that it’s supposedly British ‘summertime’, the racing schedule has changed. That’s right, we’re now entering the road race season. The road season consists mainly of criterium races. These are short half an hour long races, in which you race furiously over short, often technical laps of parks and the like. Throughout the season, there is also the odd short stage race. These races tend to be roughly four stages long, over three days of racing. My Frog bike, which I was given through my sponsor Craig at Sprockets Cycles in Kilmarnock, has been great over the cyclocross season, and the three crits races that I have already done this season. But I have now grown (a little bit) so the Frog no longer fits me quite as well. That means that I will hand it back in to Sprockets and I'm moving on to a carbon fibre Kuota. This bike should be amazing for Criterium racing, as it is super light, aero and stiff, and the fact that it is equipped with full sized wheels will be a big step up from racing on smaller 26” inch wheels on my Frog. Also, as if that was not amazing enough, I have just got a new Genesis mountain bike to train on. Hopefully, Chris, Dave and Craig will be able to show me some of the secret trails that they know around Ayrshire! All in all, it looks like this season is going to be amazing, and really great fun, thanks to the constant help and support from the guys at sprockets’ cycles in Kilmarnock, and not to mention my dad Lindsay and JP and Jo Baxter. Frog Bikes have teamed up with Team Sky to produce a range of Kids Lightweight Bikes to suit the needs of any Kids looking to get into cycling, wheter it be Balance Bikes or Road Bikes, they have created something for them all. Personally we think these look amazing! Currently wishing we were kids again! These will be with us very shortly, just in time for Christmas, but best be quick, Pre-Orders have already started coming in! Yesterday saw the release of the ALL NEW Genesis Carbon Road bike, ZERO. We waited impatiently all day for the shipment to arrive, we were like kids at christmas. It finally arrived mid afternoon and we set about building them straight away. First impressions are everything and these bikes do not disappoint. straight out the box the quality of the build is noticeable, the carbon frame is flawless, the shapes and lines on these are amazing, the pictures definitely do not do it justice! Ranging from £1299.99 for the "Entry Level" spec (entry level should be used loosely, Tiagra builds are far from entry level!) all the way up to the Dura Ace spec ZERO Team edition at £4499.99, there is something for all budgets and you will be hard pushed to find this good a bike for this money in our opinion. With their first foray into carbon bikes, Genesis have created a range that is not only great value for money but a definite contender in the weight stakes too! Today Genesis launches its first carbon range, Zero. Zero has been over 18 months in development and will make its race debut at the 2014 edition of the Tour of Britain starting in Liverpool on 7th September, piloted by the Madison Genesis team. The Zero forms a range of six models starting at £1299.99 for the Zero.1 and topping out at the Dura Ace equipped Team model, at £4499.99. Crucially, the same frame is used throughout the range, which means all customers benefit from the same great ride characteristics. Zero.1 and the Team edition are available now here, the full range will be available end of August, 2014. The Zero has been specifically designed to meet the extreme demands of stage racing where reductions in overall weight and aerodynamic improvements can make a real difference; the resulting frame now weighs-in below 1kg. The bike will sit alongside the team’s current 953 Volare providing riders with more choice dependant on the race and terrain faced. With comfort in mind, we have designed the frame to take a standard 27.2mm seatpost to provide more compliance than found on bladed seatpost designs. The rear triangle features pencil thin seatstays which help to further provide compliance and comfort to the ride. Zero however, is a race bike at heart. The large Kamm-tail downtube ensures a stiff pedalling platform but significantly provides an aerodynamic advantage, an advantage that is becoming increasingly more important in the modern world of bike racing. The crown on Zero’s custom fork is designed to flow into the downtube. Closing this gap helps to improve airflow and minimise turbulent air behind the fork. We pride ourselves on making quality, British-designed bikes and have invested heavily in our own moulds to ensure Zero meets our own design standards by having complete control from design, through testing and ultimately throughout the manufacturing process. Zero even comes with a lifetime warranty. Phil Hamill, Genesis Brand Director said: “We are excited to announce our debut carbon range, Zero. This gives the public and the Madison Genesis team a full choice of frames, which excel in different environments - the Volare will continue to be used in next year’s Pearl Izumi Tour Series whilst the Zero will be used in stage races, such as the Tour of Britain. Our first proper post on our Blog, might as well make it a nice one. Here we are building a BRAND NEW Santa Cruz Nomad Carbon, comes with a SRAM X01 groupset, Rockshox Pike Forks, Hope Wheelset and a Rockshox Reverb Stealth seatpost.........AND ITS BLACK! 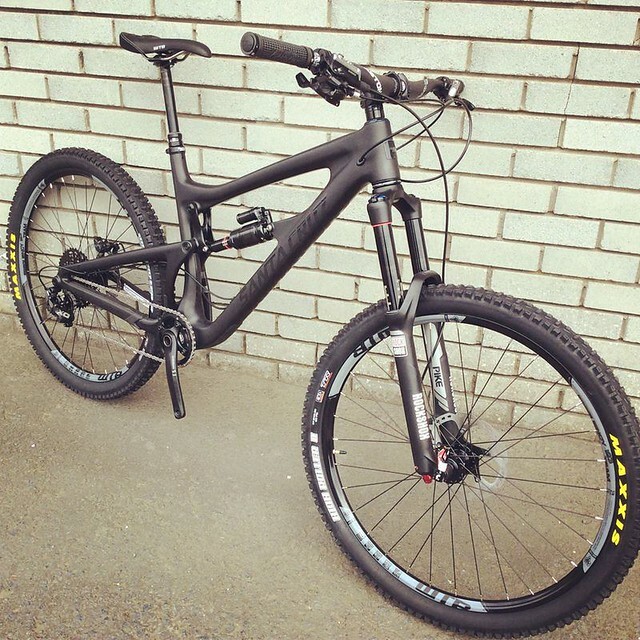 Here is The finished product : Stealth Carbon Nomad with Pikes. We will be getting a Stock Nomad in very shortly too, why not pop in and have a wee look for yourself?